Shirdi Sai Baba Stories,Leelas and Teachings. : Ram Vijaya-Chapter 37. Here is chapter-37 from the book Ram Vijaya. Readers who have missed out any chapter can read them by clicking on the link provided below this chapter . Jai Sai Ram. The negotiations for peace having fallen, through, Susen marched against Lanka with twenty kotis of monkey-soldiers and fought with the troops of Ravana under the command of Dhamaraksha. Susen routed and defeated them all, and their commander was killed by Maruti with blows. The news of the defeat having spread throughout Lanka, the demon-king, boiled with rage, sent the demons, called Vazra Dausti and Sukpana, with a number of demon-soldiers, but they were also defeated with heavy loss. Ravana was alarmed and did not know what to do. But, in the mean-time, his son, Indrajit, kept the field with the warriors,Jambumali and Vidyaman and let off arrows at the army of Rama which the latter cut off and killed the two warriors. Whereupon Indrajit immediately jumped with his chariot into the sky, where he hid himself in the clouds and let off serpent-weapons at the army of Rama, which produced innumerable serpents. These serpents stung Rama and Lakshuman and all their soldiers; and consequently they all fell lifeless in the field, except Maruti and Vibhishan, who were immortal. Indrajit, having thus defeated Rama, returned to Lanka with a great success. The demon-king was very glad at the success of his son and- said to his sister, Trijata, " Sister ? Look at the valor of our Indrajit. 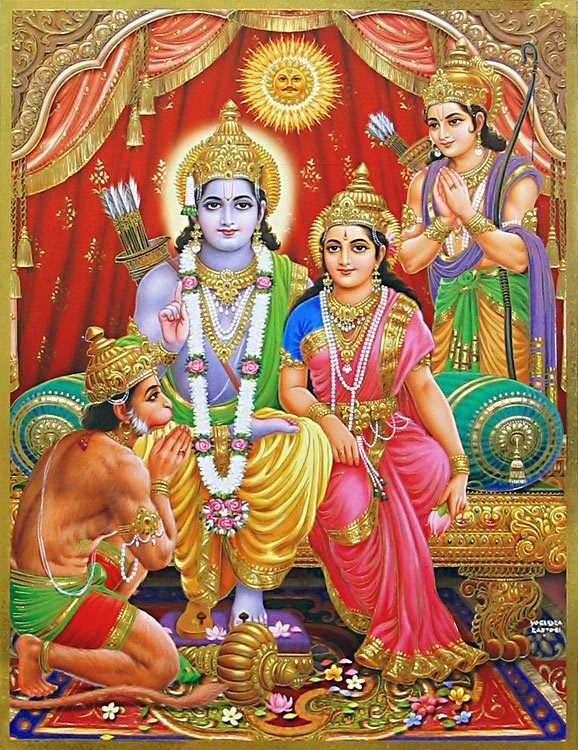 How has he fought and how has he defeated the army of Rama ? You know, nobody on earth can conquer us. Now what I want you to do is that you should now go to Sita and inform her of all that had happened. Show her Rama, Lakshuman and their soldiers lying lifeless in the field and tell her that she is now helpless and I am the only one who can support her. Tell her all this and persuade her to marry me. ! sister, I like her much." Trijata accordingly showed to Sita, Rama, Lakshuman and the monkey soldiers lying lifeless in the field and told her all that Ravana had said. 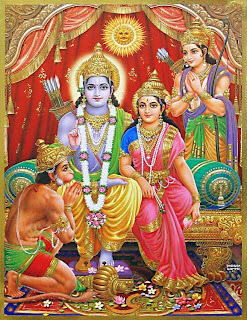 Sita, having seen her beloved Rama and Lakshuman, violently cried and became hopeless. Maruti and Vibhishan consulted together as to what they should do to resuscitate the princes and their army, but before they arrived at a certain conclusion, the Wind had come and whispered to Rama a garuda mantra which produced garudas or eagles. These garudas killed all the serpents and resuscitaed Lakshuman and their army. The fighting was again renewed by the monkeys. Pravasta, the minister of Ravana, bravely fought with them and killed many of them. Whereupon Nala threw at the minister one lac of mountains which the latter broke in no time and continued the fighting. But after a hot battle Pravasta was killed by Nala with a tree called Tada, a hundred yojans in length.